I went to the Spring Session of Toronto's Festival of Beer today ... it's the first time I've been to it. I had an advanced ticket ($30 which included the sampling mug and five drink tokens). Tickets were available at the gate for $45. 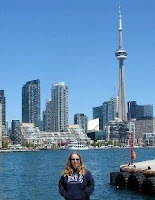 It was at Garrison Common at Fort York, which is a short walk from home. There was lots of space and lots to do! No one seemed deterred when it started to rain. Revivale from Lost Craft ... thanks, Cam! Thoughout the afternoon, there were good tunes playing from the 80s. I didn't stay long enough to see the Trews (they were supposed to start at 5:30pm).